The “vintage” pink and black bathroom before the remodel. 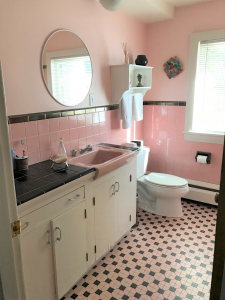 The distinctive black and pink tile and matching pink tub of the 1950s has its place in history, but no longer had a place in Elissa Grad’s home. While it was still functional, the “tired” bath had to serve not only her children, but it also served the nearby guestroom. 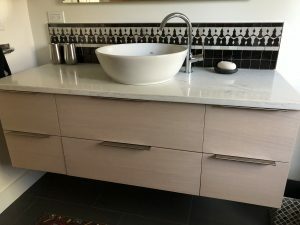 It was clear that the bathroom needed a face-lift, but what the Grad family didn’t know at the time was that the bathroom was rotting from the inside out. Rot and mold lurked behind the pink and black tile of the old bathroom. 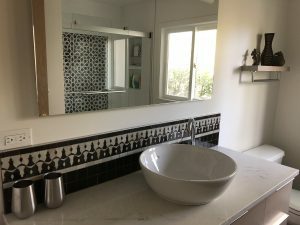 When the Gallagher Remodeling team demolished the bathroom, what they found behind the tub wall was the result of years of water slowly seeping behind the tile. 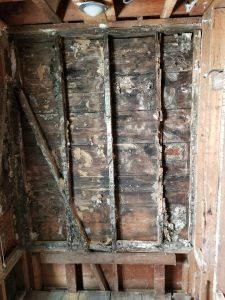 All the rotten wood and mold made them realize that this wasn’t a mere facelift but would become a badly needed restoration project. Within a few days walls had been rebuilt, and then they were made water tight. Before starting the work, the Gallagher team collaborated with Elissa to choose finishes. These were inspired by the Grad family’s trips abroad. “I had seen tile in Morocco and India with lattice detail,” explains Elissa. 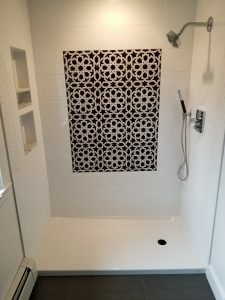 “I shared the photos I took with the project designer, and she sourced the gorgeous tile we used on the shower wall and along the backsplash.” Each 12-inch section of the shower design is actually comprised of smaller, hand-made, mosaic tiles. 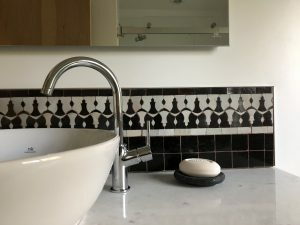 A complimentary tile design was added for the backsplash at the sink.